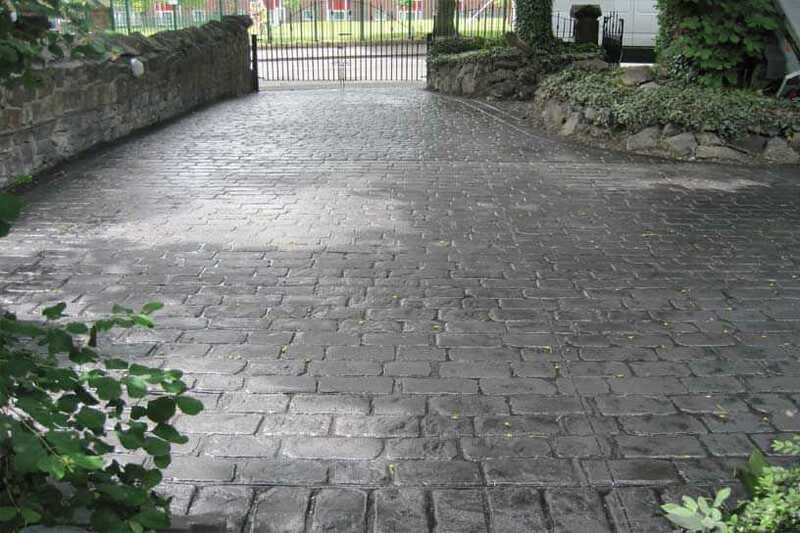 Patterned concrete driveways are a low maintenance solution. Many homeowners choose to opt for patterned concrete driveways due to their low maintenance. Patterned concrete is a method of stamping the surface of the ready mixed concrete. Once this is stamped it gives a look of cobbles, tiles, stones or even bricks depending on the pattern chosen. This type of paving comes in a wide variety of styles, colours and is very popular due to it requiring very little maintenance. In hot weather sometimes tarmac driveways can begin to melt. With patterned concrete driveways, the difference is you get a more hardened and resilient surface which has a permanent colour and pattern. Furthermore, the colour tends not to fade, slip or break up offering a longer-term lifespan. In addition to laying driveways with the patterned concrete, many homeowners choose to lay pathways and patios, again giving them a longer term low maintenance solution. Our range of services also extends to the following to complement your driveway installation. Whether you want a new lawn, fencing, decking etc. You can see a range of our other services below. Free quotations in the North East. If you would like to keep informed of all our latest news please join our Facebook Page. You can keep up to date with all our latest news offers, promotions and projects.